Galangal has a distinct flavor that combines bitter, sour, and spicy together. It adds a distinctive aroma and delicious taste to a wide range of Thai food, including tom kha soup, curry paste, and assorted vegetarian dishes such as Thai vegetarian soup. Galangal looks similar to ginger, and like ginger it grows underground (see photos below of galangal plants that we took at an organic garden in Thailand). Galangal reduces the fish smell in foods. Young galangal is nice and white, with pinkish tips and plenty of oil for aroma and flavor. 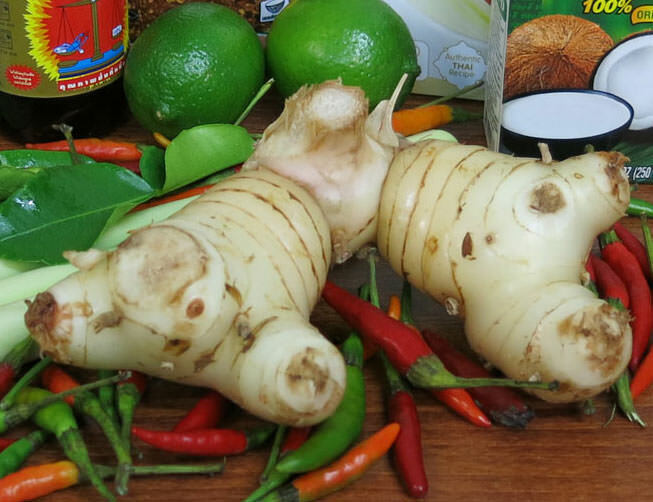 Young galangal, what we offer for shipping, is typically used for any recipes you might find served at Thai restaurants (tom kha, tom yum, etc). Old galangal might be underground for a year or more, is a darker color, is more woody, and often favored by the older generation of cooks who like it for the slightly different taste and strong aroma. Thomas Keller (French Laundry) recommends our fresh galangal. We ship fresh USA-grown galangal via Priority Mail, quick delivery within 2-3 days straight to your mailbox. They are packaged well and should be refrigerated promptly. Please Note: if you order only fresh produce, select "$0.00" as shipping charge at checkout (because the prices below include shipping). Occasional delays due to Mother Nature & harvest conditions. Call 888-618-8424 if you need a definite delivery date. If you order fresh galangal and any other non-fresh items, please checkout with "Ground" as the shipping method, and you will receive the other items separately. Galangal is also known throughout the world for it's wide range of medicinal effects, everything from reducing cancer in tests sponsored by western researchers, to being revered in Ayurvedic medicine. Galangal, mixed in a mortar and pestle with tamarind juice and salt is said to help mothers immediately after giving birth regulate their blood flow. It's used as a cure for general pain relief, as a quick remedy after heart attack, it stimulates digestion, even sea-sickness. Galangal boosts the immune system, treats flu, the common cold, and is a breath freshener. Good quality fresh galangal will keeps for a few days in the fridge before it starts to change color and break down. For long-term storage, cut into 2 or 3 inch pieces, and freeze in a ziplock bag. We also offer a Fresh Thai Produce Kit. We offer dried galangal, and galangal powder too. Thai Pork Satay, "Moo Satay"
Northern Thai Pork Curry, "Gaeng Hanglay"
Spicy Dip for Thai Vegetables, "Namprik Ong"
Thai Beef Flambe, "Neua Pad Kimao"
Tom Yum Style Stir-Fried Rice, "Khao Pad Tom Yum"
Steamed Thai Dumplings, "Pun Sip Neung"
Thai Pork with Galangal, "Kha Moo"
And a lot more from our Recipe Collection! Try our Tom Kha Kit. Extraordinary Value. "Tom Kha Gai" is one of our favorite Thai recipe, and it's been a favorite of our customers for years. Here's everything you need to make several large servings of the best fresh home-made authentic Tom Kha. A thoughtful mix of fresh Thai herbs with all ingredients. Expedited to your door via 2 day shipping to ensure fresh delivery. You'll also be able to make other Thai recipes. This is a great value and includes one Amazing Elephant Tom Kha. Checkout with Ground shipping and we'll upgrade it to expedited 2 day at no extra charge.